As the nationwide drought continues to linger, paddlers from around the country will be licking their lips about the guaranteed water release from the Grassridge Dam for the two-day Fish River Canoe Marathon from 5-6 October. Now well established as one of the most popular races due to the consistently good water levels, the Fish is a race that is enjoyed by novices and professionals alike and this year the country’s top paddlers will be fighting it out for the SA K1 River Marathon title. 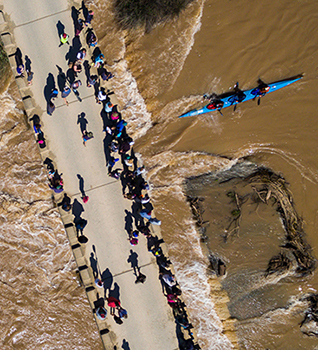 With the opening day being 48km, starting with a 2,3km stretch across Grassridge Dam and a quick portage, the opening 9km often sees a large group of paddlers bunched together as they approach the first major obstacle at Keith’s Flyover rapid. From there the field thins out slightly, and if you are able to gain a slight advantage it will be difficult for the chasers with the second day only being 36km long. Day two’s iconic obstacle is the Cradock Weir that comes just a few kilometres from the finish, and in the past it has provided Some dramatic moments that has often decided the final outcome of the race. The Fish in nature is a fast-paced race giving paddlers very few opportunities to get away from the opposition should no mistakes be made. In 2016’s K1 shoot-out both days came down to end sprints in the men’s race with Euro Steel’s Hank McGregor edging his 2018 FNB Dusi K2 partner Andy Birkett for the title. This rivalry that has developed over the years has blossomed into friendship with the pair racing the upcoming ICF Canoe Marathon World Championships together in what is widely regarded as an dream K2 combination. The effects of racing at the World Marathon Championships should have subsided when the paddlers head to the Klein Karoo town over the first weekend of October. Despite their friendship they still maintain a healthy rivalry and the SA K1 Championships will provide another enthralling chapter in this modern-day battle of the titans. With the Fish being one of the premier river races on the calendar the elite field is always extremely strong and will include local star and defending K2 champion Greg Louw. Louw finished third behind McGregor and Birkett in 2016 and will be hoping to push the pair in 2018. The ladies showdown will see a new K1 winner crowned following the 2016 and 2014 dominance of Abby Solms. There are a number of paddlers who will be in the running for the top spot on the podium with Bridgitte Hartley, who was the runner-up in 2016, and Jenna Ward sure to feature as potential title winners. There will be a further challenge from the wings and the pair of Hartley and Ward will have to be careful throughout the two days because there will be a group of paddlers including Christie Mackenzie ready to pounce. The young Mackenzie has come into her own following her second place finish at the 2017 FNB Dusi and followed that up with a K2 second this year. She won bronze at the 2017 ICF Canoe Marathon World Championships and will be hoping for a podium at the Fish this year. Once again the Fish River Canoe Marathon will provide all the paddlers with two days of entertaining paddling and partying with the event commonly referred to as the biggest party in paddling.